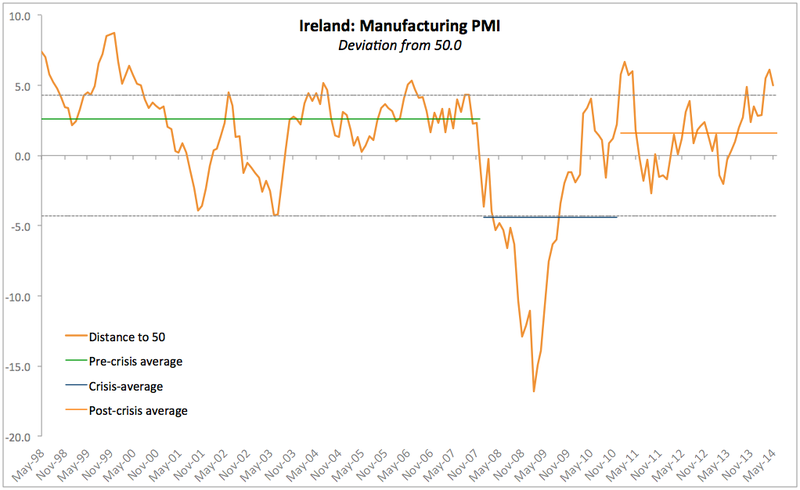 Both, Irish Services and Manufacturing PMIs are now out for May 2014 (via Markit and Investec Ireland) and it is time to update my monthly, quarterly and composite series. Manufacturing PMI eased from 56.1 in April to 55.0 in May - a decrease that reduced the implied estimated rate of growth in the sector. Still, Manufacturing index is reading above 50.0 (expansion line) continuously now since June 2013. 3mo MA through May is at 54.8 - solid expansion and is ahead of 3mo average through February which stood at 53.1. So expansion accelerated on 3mo MA basis. The current 3mo MA is ahead of 2010, 2011 and 2013 periods readings. Over the last 12 months there have been only 3 months with monthly reductions in PMIs: November 2013 (-2.5 points), January 2014 (-0.7 points) and May 2014 (-1.1 points). 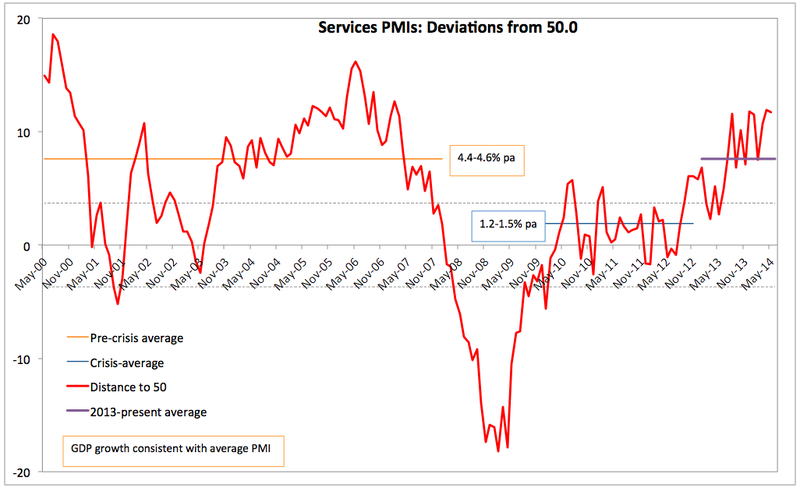 Services PMI eased only marginally from 61.9 in April to 61.7 in May - this implies that services sector growth barely registered a decline and remained at a blistering 61-62 reading level. Services index is reading above 50.0 (expansion line) continuously now since July 2012, helped no doubt by a massive expansion of ICT services MNCs in Ireland, which have little to do with the actual economic activity here. 3mo MA through May is at 60.0 - solid expansion and only slightly below 3mo average through February which stood at 60.3. The current 3mo MA is ahead of 2010, 2011 and 2013 periods readings. Over the last 12 months there have been 5 months with monthly reductions in PMIs, all sharper than the one registered in May 2014. In line with the above chart, rolling correlations between the two PMIs have firmed up as well over recent months, rising from 0.33 in 3mo through February 2014 to 0.5 for the 3mo period through May 2014. In April 2014, Construction sector activity index rose to 63.5 from 60.2 in March 2014. This marks second consecutive month of m/m increases. In the last 12 months, there have been 7 monthly m/m rises in the index and index has been returning readings above 50 since September 2013. 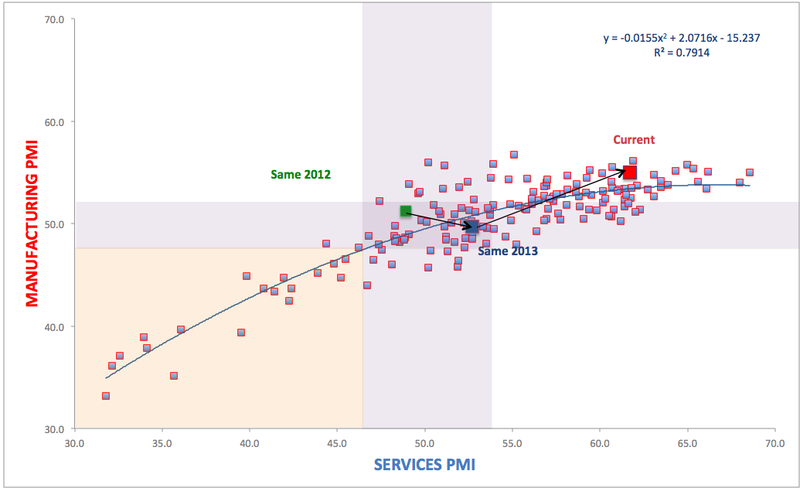 Caveats as usual are: MNCs dominance in the indices dynamics and shorter duration of statistically significant readings above 50.0 line: Manufacturing shows only last three consecutive months with readings statistically significantly in growth territory; while Services index producing statistically significant readings above 50 for the last 6 months. Next post will cover quarterly data and composite PMI.